True Wins did okay over the weekend — predicting the 49ers and Patriots victories, but whiffing on the Ravens and Falcons. 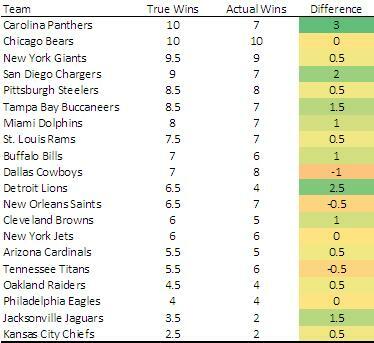 Picking the team with more True Wins so far has six correct and two wrong, while relying on actual wins to pick has just four right, two wrong, and makes no prediction on two games (same records for Pats-Texans and 49ers-Packers). The True Wins king — Denver — is out! Over the last ten years, the top team in True Wins has won four Super Bowls, and the second ranked team has won two more. It’s up to the Patriots (#2) to carry on the tradition, even though the 13.5 True Win Broncos had the second highest total in the last ten years (behind another famous losing team that you may remember). That couldn’t save them from one very cold Manning flinching first in a stalemate and one very cold Champ Bailey getting toasted over and over again (not to mention one very cold referee blowing a couple video reviews and throwing a ton of flags on the Broncos). More on the playoffs later in the week, but for now, I want to go back to some old predictions and talk about this year’s playoff spectators. The first thing that has to change are the names. Cam Newton moves up a notch and replaces Vick, who unfortunately goes all the way around the horn to replace Bradford in the blow-it-up division. Rex Ryan, one of the most overconfident men in the world, is saved by Tony Romo and his buddy Troy Aikman — I can’t listen to Aikman defend Romo anymore. I’m sticking with my man Stafford and handing the “something to build on” division to him, even if my Lions regressed this year. Is Joe Flacco Elite? Barnwell strikes again! For whatever good or bad Flacco provides, he has spent his entire career as the starting quarterback of the Baltimore Ravens, who perennially possess one of the league’s best defenses. He also has Ray Rice and a solid running game to go alongside him on offense. It’s safe to say that a win by, say, Cam Newton usually requires more work from the quarterback than one by Flacco. I agree with this wholeheartedly. In response, Barnwell tries to capture quarterback value by creating an “expected wins” measure based on points allowed by the defense and comparing this to actual wins. He argues that a quarterback with more actual wins than expected wins is doing well because he is scoring more points than average. An example helps explain the concept. First, Barnwell notes that teams have won 86.5% of games recently when allowing between 8 and 12 points. Imagine a team that allows between 8 and 12 points in all 16 games. They are expected to win 86.5% of those games, or 13.8 games. If the team won 14-16 games, Barnwell would argue that the quarterback is doing better than average, while if the team won fewer, Barnwell would argue that the quarterback is doing worse. As hoped, Flacco is unimpressive by this measure (while the usual suspects — Tom Brady and Peyton Manning — are top dogs). He has 44 wins in 64 regular season games, but because the Ravens D is so good, an average QB would have managed about 42. I didn’t get to watch a lot of football yesterday, but I did watch the end of the Cowboys-Giants showdown, where the winner would take control of the division. Secretly, I don’t think either of these teams are very good, and selfishly, I was rooting for the Cowboys, which would help my Lions slightly in the wild card race.